If you love perennial plants with a long blooming season, you will likely have a fondness for growing hollyhocks. This lovely perennial is a popular garden favorite that flowers throughout most of the summer months. Hollyhocks (Puccinia malvacearum) are often found in cottage gardens. They make a great background plant for shorter perennials and come in a wide variety of colors. 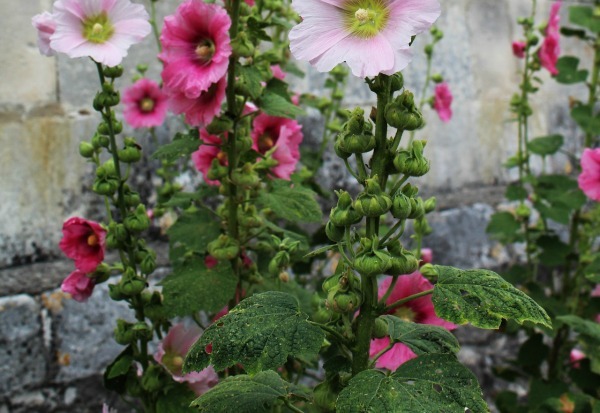 If you love adding plants for your cottage garden, try your hand at growing hollyhocks, these tips will help you to grow and care for them in your yard. Be sure to plant hollyhocks in sunny locations. Since they have very tall flower stalks, protect them from the wind to avoid breakage. A good spot is in front of fence with slat openings to give the plant air circulation or at the back of a garden bed in a full sun location. Hollyhocks like moist, well draining soil. Adding organic matter such as compost in the spring will help, too. If you plant them in too dry a location, they will languish during the heat of the summer and won’t produce flowers well. The flowers are produced on very long stalks that tower over the garden. They may need staking. They range in color from white to deep burgundy and all shades in between. Many hollyhocks have pink flowers but this is not the only shade for them. The flowers have a slightly scalloped edge with a pretty throat and are profuse on each stem. 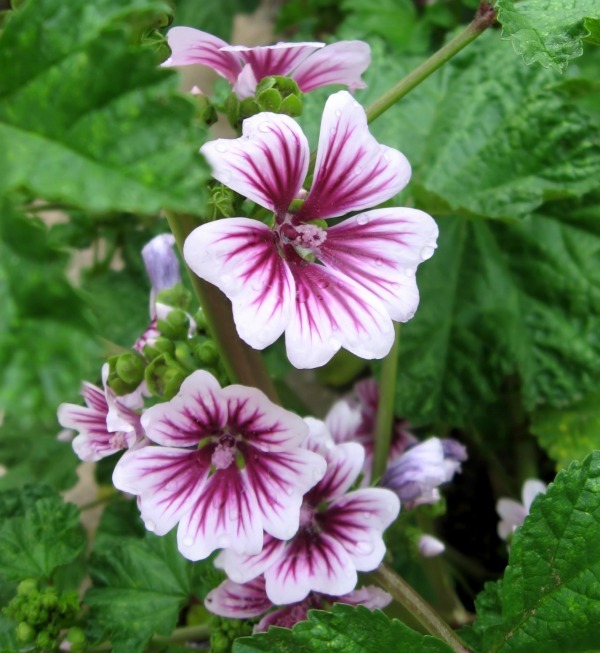 Some varieties, like this purple variegated hollyhock comes in more than one shade. Hollyhocks grow easily from seed. Plant them just below the surface and space them about two feet apart to give them room to grow. 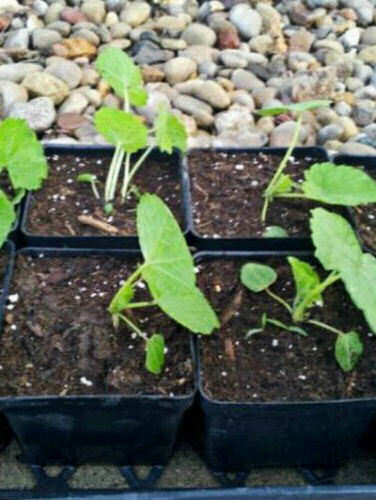 I chose hollyhock seeds in my project for starting seeds in peat pellets. Check out the tutorial here. Hollyhocks are rampant seeders. If you dig them up and plant them in small pots, they will grow and give you additional plants for other areas of your garden. Seedlings are not normally quite as strong or as vigorous growing as the original parent plant. You can also collect seeds from existing plants to save for future plants. Root cuttings will also produce new plants. Hollyhocks have a long blooming season and will flower from mid summer until early fall. Blooms start near the base of the stem and open upward so that eventually 1 1/2 to 2 feet of the stalk is covered in petals. The leaves of the hollyhock plant are large and dark green with a rounded shape. They are prone to a rust fungus called puccinia so care should be taken when watering. 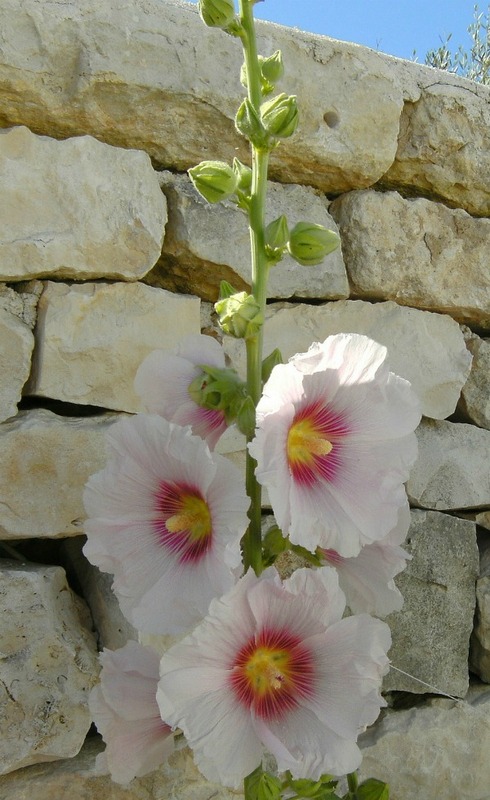 Hollyhocks are considered as perennials in zones 3-8. Typically they are a short lived perennial of about 2-3 years. In colder zones, treat the plant as a perennial, or take cuttings or plant seedlings and bring them in during the winter months to replant again in the spring. This pretty perennial makes a great screening plant to hide more unsightly areas of your yard, since it grows to quite a tall height. Use it at the back of the garden bed with shorter plants in front of it for best effect. The make a great border plant near the side of your house to add curb appeal and height to hide the foundation. (note that this limits the air circulation so it’s not a good choice if your garden is prone to rust on hollyhocks. 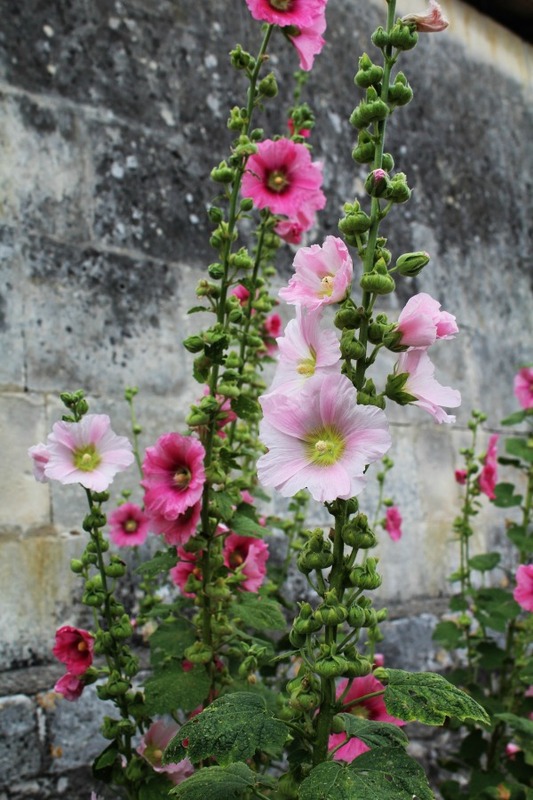 Hollyhocks add a lovely vertical element to your garden because of their long flower stalks. Some can grow to 9 feet tall! Hollyhocks have a tendency to develop rust, so take care to water from below to keep moisture off the leaves. Giving the plant good air circulation also helps. Mulching under the plant will keep the spores from last years plants from developing. This pretty plant can be a short lived perennial, lasting only 2-3 years. You can prolong this to several more years if you remember to cut off the flower stalks close to the ground after they have finished blooming. Hollyhocks by the bucket load from a reader! Angela Marinaro, a fan of The Gardening Cook on Facebook had a large bed of hollyhocks in her garden which contained four hollyhock plants that she put in a few years ago. Last summer she transplanted just four of them into this spot in her front yard . She says that her hollyhocks got enormous, bloomed almost all summer died off, and then bloomed again late fall. Angela had numerous seedlings that she potted up with great success the following year after this photo was taken. 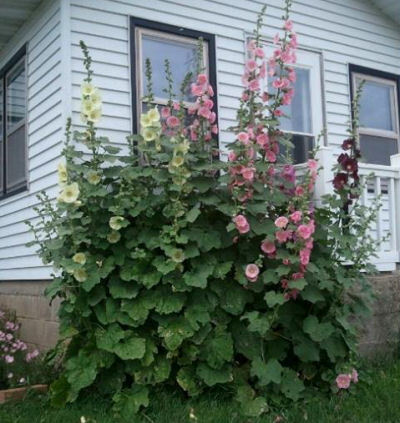 It shows the immense height of hollyhocks! 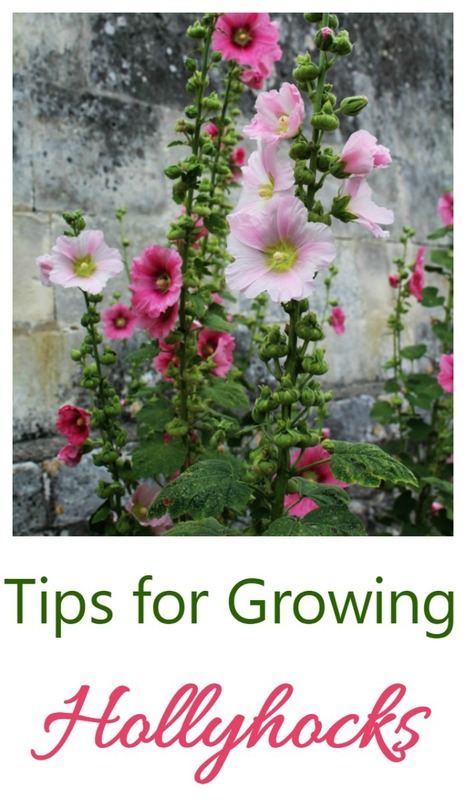 I hope that these tips will be useful to you to help with growing hollyhocks. Growing this lovely flower will add color and dramatic height to your garden. You can pin the following image to Pinterest so that my tips are handy for you. 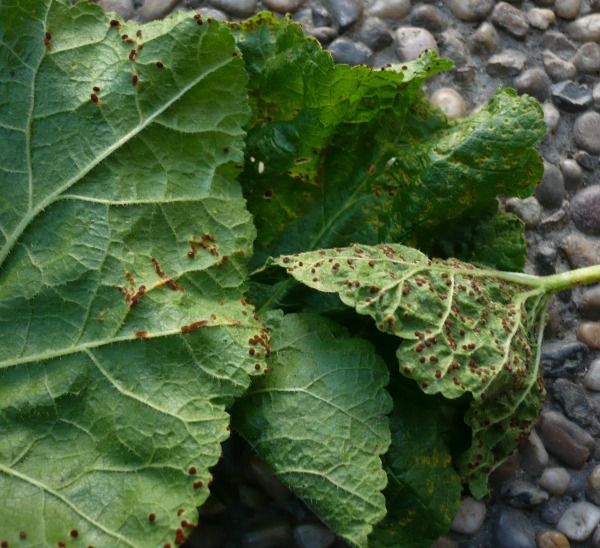 Puccinia is the name of the ‘rust’ fungus, which commonly grows on Hollyhock plants (Alcea rosea). I have a smooth soil here, whether Hollyhocks will be able to survive well, or use sand in this soil. The way to grow Hollyhocks from the seeds was good. Can this plant be grown at this time? There is no organic remedy to avoid rust fungus.